Art that ravishes the senses is such a delight. When a specific combination of materials elicits a powerful response in the mind and body, when it just washes over you and you don’t even have to think about it, this is how you know it’s working. 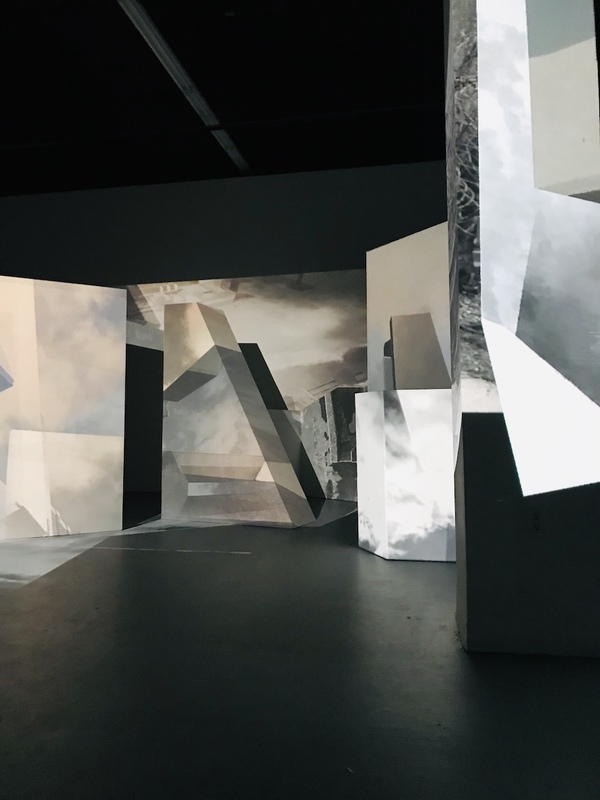 Singular Space, the immersive multi-media exhibition created by Liz Donadio and Shannon Collis at ICA Baltimore, delivers a range of the lofty sensations that monuments are designed to inspire in surprising and innovative ways. As you enter the cavernous darkness there is uncertainty tinged with fear as your pupils dilate. 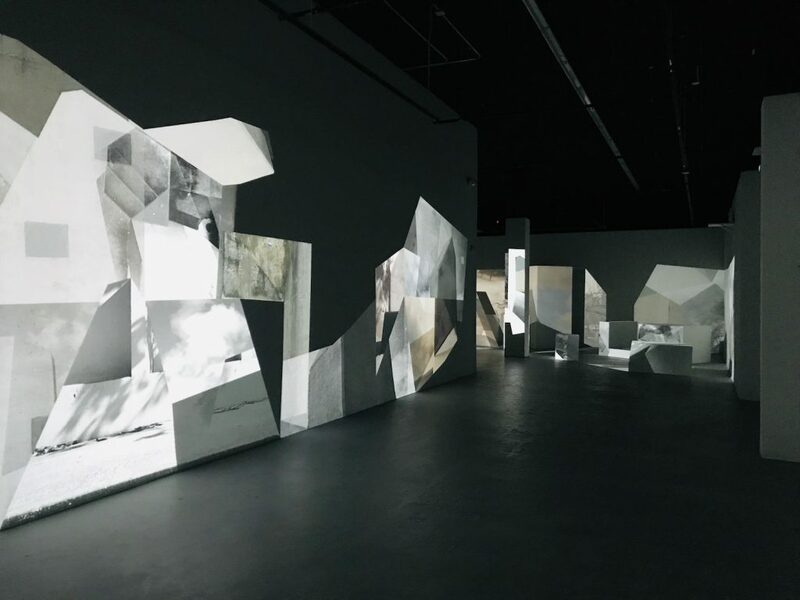 Then you take a few slow steps into the gallery, and your retinas expand to take in the soaring kaleidoscope of black and white undulating images projected cinematically on a giant wall. It’s a little like tripping on acid at a cathedral or some other white holy structure made of expensive materials intended to awe, but without the guilt. It’s also like walking into a giant ice crystal that’s been magnified a million times, cast into concrete, and then animated. 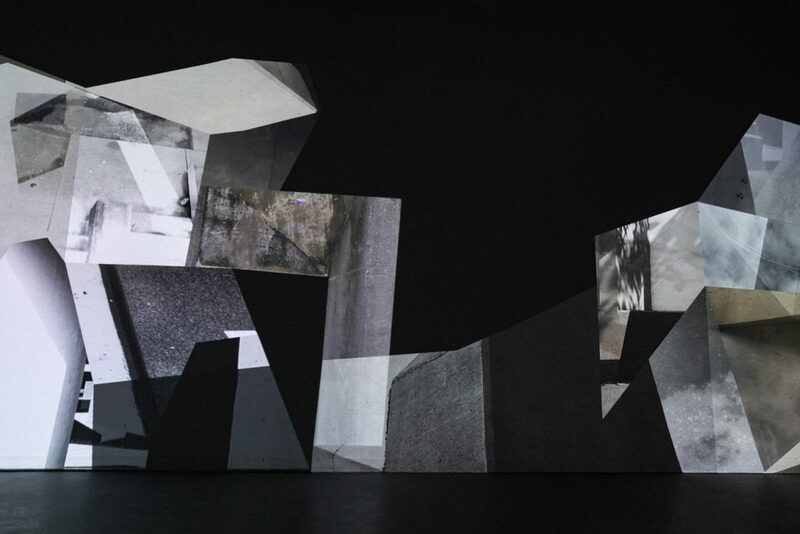 As the pristine geometric edges of the projected video refract and roll at a soothing pace, blending between moving and still images, sharp angles, marble slabs, and gritty textures dance across the walls. A slow thrum pulses against your eardrums, enveloping you in a soothing bath of sound. The rhythm and timing is just right for the motion of the video; too fast would be dizzying or aggressive and too slow would be dull. The scale of the projections from the five projectors soars above you, and the sounds ground you in a meditative way, but without being hokey. You walk deeper into this space methodically, like a monk on a religious pilgrimage, and the space returns your solemnity with more solemnity. I wasn’t kidding when I used the word ravish. Like the best monuments, Singular Space offers a complete sensual experience, engaging equally with body and mind, and your rapt attention is rewarded through every sense available except for smell, which could be an interesting addition. Composed of photos, video, and audio created at Miles Stafford Ralph’s 1975 Forum Fountain, a rundown Brutalist-inspired public sculpture located behind Paul Laurence Dunbar High School in East Baltimore, Singular Space functions like a monument to a monument, successful because it is fluent in the language of monumentality. The exhibition effectively captures the cadence and essence of monumentality itself, well versed in gravity, scale, history, and rich material textures. Like all types of memorials, it reflects human aspirations but is blank as a grave. 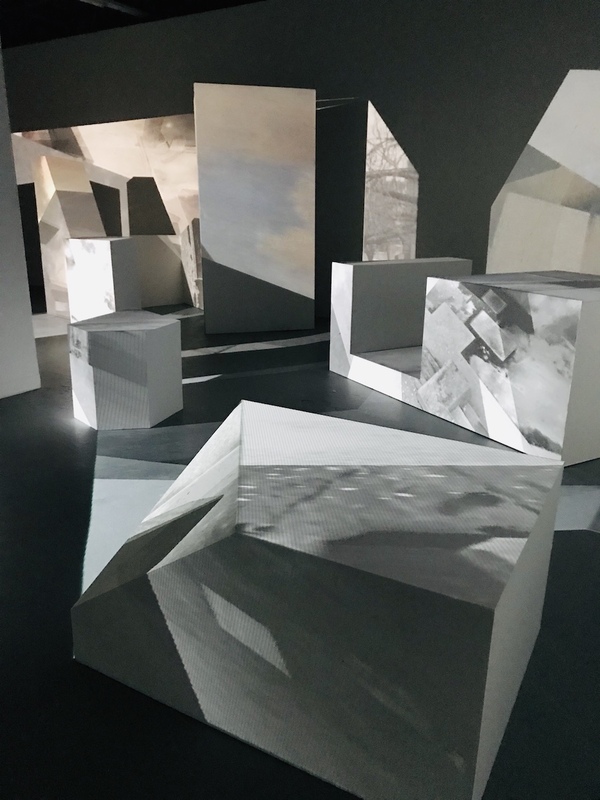 Taking it a step further, this exhibition captures the experience of experiencing a monument, harnessing the power of movement and sound to convey place, time, and context. As you walk deeper and deeper into a gallery that is shockingly large and seemingly full of moving stalactites, a sense of devotion manifests itself, the type of fervor that I mainly reserve for an isolated beach or a snowstorm. It’s quiet, with a satisfying rhythmical purr that matches the deliberate movement on the walls, and it makes you feel really good, like your positive ions or your mitochondria are dancing around inside your body. 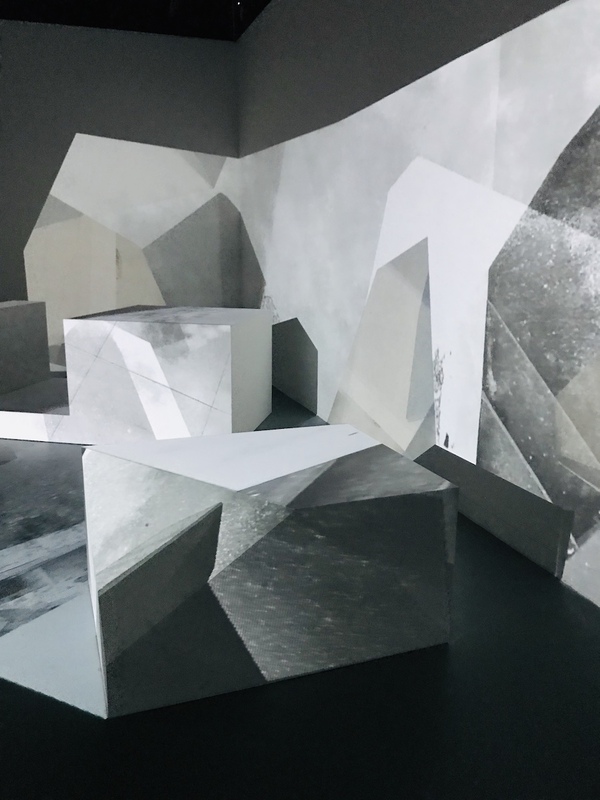 This installation combines many different elements, but not too many, and segues from monochromatic into subtle coloration at the back of the gallery. 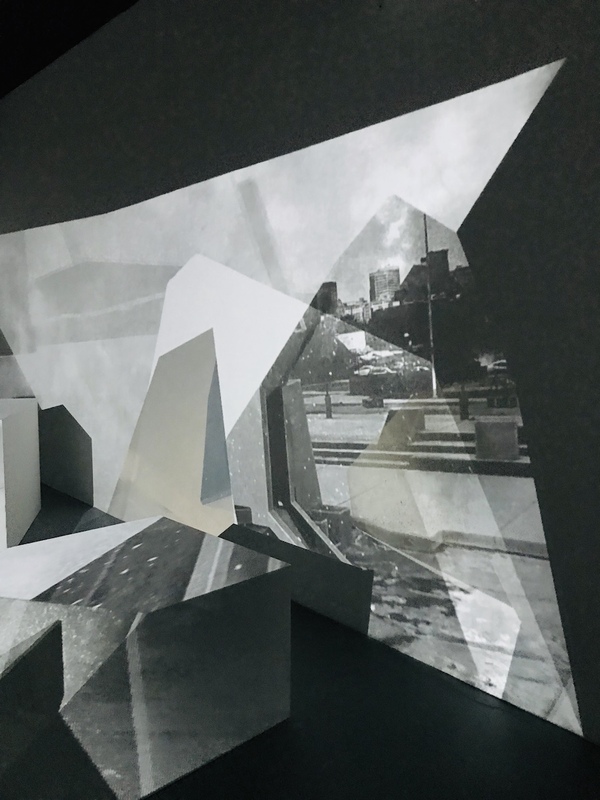 Images of the Brutalist structure, both abstracted and whole, blend with snippets of street scenes, the vague sound of traffic, and aerial views that refract over white geometric podiums of strange iceberg-like angles. It’s an Ingmar Bergman beach in abstraction. It’s white, gray, black, and tan, with buttery marble, gritty pavement, chilly sky, and squares and rectangles big enough to sit on. It’s a field of warm geometry. It’s an ecstatic religious experience, multi-sensory but not sensory overload. I started to wonder if a monument’s power dissipates over time? Or, by its very existence, does a monument grow more potent with longevity, even in the throes of natural decay? Even in the face of disrepair, the age of a monument adds to its credibility, broadcasting a message of inevitability and permanence but also growing less specific in its original message, sometimes shifting radically to represent historic values and movements in unintended ways, certainly less so the events or individual humans it was originally designed to signify. It’s an Ingmar Bergman beach in abstraction. It’s white, gray, black, and tan, with buttery marble, gritty pavement, chilly sky, and squares and rectangles big enough to sit on. It’s a field of warm geometry. It’s an ecstatic religious experience, multi-sensory but not sensory overload. In Baltimore, even the four empty plinths where Confederate monuments once stood until their removal by Mayor Pugh on August 15, 2017 are a testament to the lasting power of historic monuments. 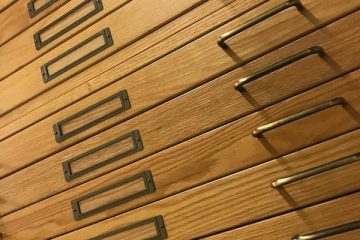 Their removal in the middle of the night, with its secrecy and speed, reveals that these objects contained the potential to create serious havoc or political turmoil. 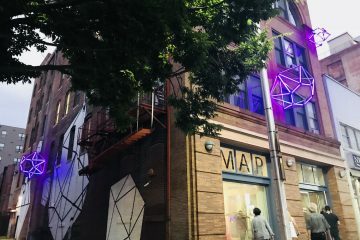 Their removal was not just a symbolic re-writing of history, it was an ethical and heroic gesture designed to signify that the tacit celebration of racist ideals would no longer be tolerated in Baltimore and an acknowledgement that these structures acted as a daily insult and provocation to Baltimore’s citizens. If an empty plinth can effectively function as a monument to progressive idealism in 2019, what does the decay of Baltimore’s Brutalist monuments, built mostly in the 1960s and 70s, say about the city today? Our more abstract monuments are worth consideration, especially the group of Brutalist fountains and structures which have steadily decreased in popularity, with the removal of the Morris Mechanic Theatre and McKeldin Fountain not necessarily for economic or political reasons, but for aesthetic ones. And who better to champion and contextualize these currently unloved monuments than contemporary visual artists? Forum Fountain functions as muse for Donadio and Collis in Singular Space. 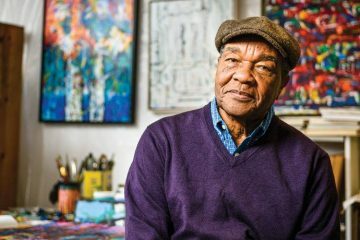 It becomes a rich springboard for ideas and sensations, for the celebration of its existence and also a reckoning around the works of public art that Baltimore City has funded over the years and then neglected. Brutalism is possibly dated and certainly an acquired taste, but Singular Space helps us to see Forum Fountain’s inherent beauty, to make it more inspiring and accessible through abstraction, sound, and movement even in its diminished state. As good citizens, are the artists obligated to employ a gorgeous sensual installation to offer social critique for Baltimore’s One Percent for Art Ordinance, founded in 1964 and requiring that “at least 1% of all eligible funds for a construction project shall be allocated for artwork for that specific project or another public art use as determined by the Public Art Ordinance”? The Forum Fountain was built with funds from this initiative and is clearly in need of care, however I’m wrestling with this question: Is this project strengthened by a Baltimore-based narrative that calls out our civic leaders for being flaky stewards of city monuments? Does this civic conversation distract from the actual work, or should the work function as a springboard into action? Is it enough for artists to fall in love with a piece of architecture in a specific place and time and to amplify this infatuation through their work? At its heart, Singular Space is a romantic gesture. It is tinged by nostalgia and the desire for today’s Baltimore to be better than it is and was and this can start in the way we represent our city visually. Compared to other cinematic or immersive video renditions of Baltimore, like Isaac Julien’s film Baltimore or any of John Waters’ campy tirades, where the artist/director imposes their highly subjective vision upon a place, Singular Space captures the spirit of a Baltimore-specific moment and offers a vision that is imperfect but still architecturally beautiful and brimming with rich potential. 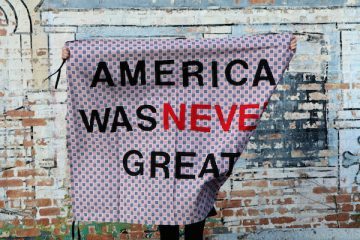 If the goal and concept of a monument is to communicate across space and time, to celebrate past victories and to mourn for fallen heroes, Singular Space captures these conflicting emotions elegantly and in a way that is universally available to everyone, including babies and those without MFA’s. This accessibility alone is an achievement to be applauded. The installation speaks fluently in the vernacular of monuments, a vocabulary developed by humans for thousands of years that encompasses pyramids and cathedrals and obelisks and grave markers. Sure, it beautifies decay, but it does so without trivializing the actual negligence of a public monument and its surrounding community, in a way that is majestic, compelling, and respectful. In this way, it functions as a monument to all monuments, acknowledging their inherent flaw: an inevitable decline despite being built to last forever, a metaphorical nod to all human attempts at immortality. 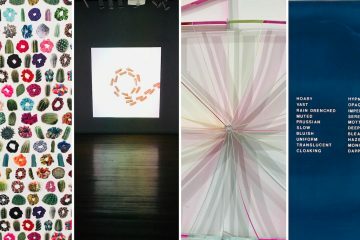 Singular Space: Liz Donadio and Shannon Collis at ICA Baltimore, January 2019 from Bmoreart on Vimeo. 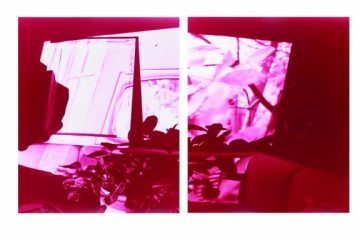 Singular Space is up through January 26, 2019 at ICA GALLERY. Photos courtesy of Liz Donadio and the author.